“Wright’s Aided Drawing series is the outcome of his performance of the 19th century artist working en plein-air. 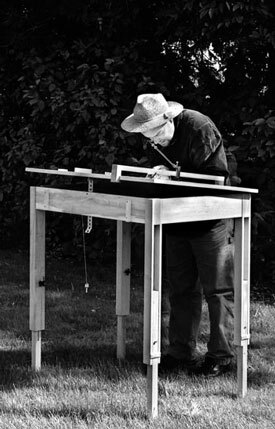 Going so far as to don the wide-brimmed straw hat, he took the studio out to the garden to begin his detailed studies. 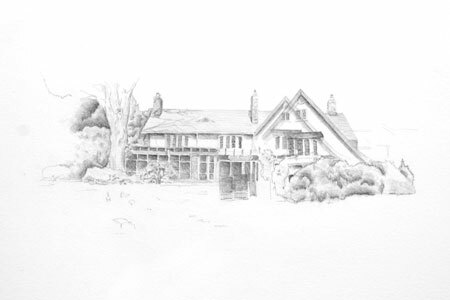 The idea of going on-site to sketch is typically understood as a way to force oneself to notice details of an environment that might otherwise go unexperienced and unseen. It seemed appropriate to this work for Wright to employ the aid of a camera lucida, a 19th century drawing tool essentially used as a way to ‘trace’ the image of an object in front of one. 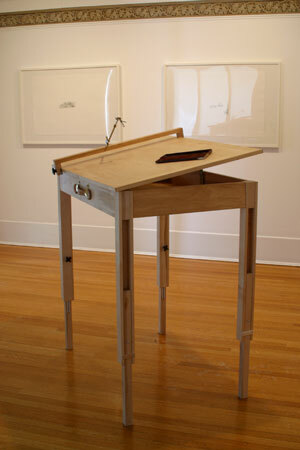 To use the apparatus one sets the angle and height of a prism, mounted on a table top stand in such a way that light reflects into the eye simultaneously from both the object and the paper to be drawn on. By aligning the eye with the prism just right, one experiences the illusion of seeing the image on the paper below and can draw its contours. Ironically, the practice of using the camera lucida is so particular that, much like using a piece of tracing paper over an image, the artist spends little time actually experiencing the look of an object, but rather focuses all attention on the discipline of coordinating the proper relation between eye, camera lucida, object, and hand holding pencil to paper.